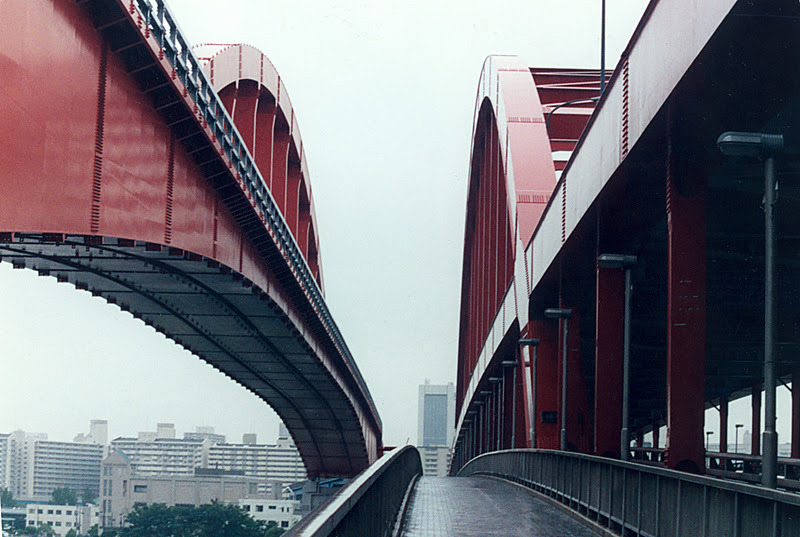 For some reason, most of the long-span bridges west of Rokko Island are painted bright red. The Port Liner Bridge on the left is a through arch with a single arch rib that carries automated guideway vehicles. The Kobe Bridge on the right is a double-deck, steel middle through arch that carries highway vehicles. Both bridges connect Kobe to Port Island. They are about 200 m long and about 50 m above Osaka Bay. I took this photo a few days after the Kobe Earthquake while walking to the KCAT Jet Ferry Terminal on Port Island. The connector that carries vehicles onto Kobe Bridge had collapsed, so I was able to walk on the deck without getting run over. Osaka Bay Bridges: Kobe and Port Liner Bridges by Mark Yashinsky is licensed under a Creative Commons Attribution-NonCommercial-ShareAlike 3.0 United States License.